When we want to delete a directory and everything in it, we normally usually use rm -rf. However, this is a bad habit to get into. If you make a mistake, you could delete your entire partition. For a start, if you drop the '-f' then at least it won't go blindly ahead and delete everything regardless of permissions etc. You can also use the ‘-i’ option which prompts you for confirmation. Deleting stuff from KDE/Gnome usually moves the file to .local/share/Trash, so if you delete from a GUI rather than CLI, then you've got that safety net. People have talked about how you could set up an alias or write a little script which replaces the rm command with a safer mv command which shifts the files to .local/share/Trash where after you could delete them from the trash icon on your desktop. Others warn of caution when using this approach as when you go to a new machine and start removing stuff left right and center without thinking, then you can do bad things very quickly. A compromise might be to setup the alias/script for safe deletion, that way you won't get into a problem. One of the alias could be rm='rm -i', which will make the system prompt you before deletion. But, this too at times become horror because after using it for a while , you will expect rm to prompt you by default before removing files. Of course, one day you'll run it with an account that hasn't that alias set and before you understand what's going on, it is too late. Then you can create your own safe alias, e.g. 3.Now, here's the code just paste this into your .bashrc file. Instead of trash, you can redirect to another folder also, just don't include a slash(/) at the end of path in TRASHPATH variable. 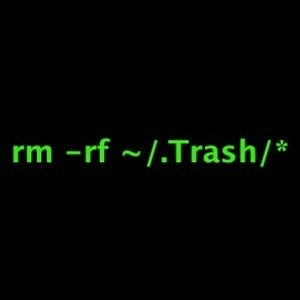 Another alternative can be using trash command instead. It is compiled Objective-C and cleverly uses standard file system APIs and, should it fail (i.e. user doesn't have sufficient rights), it calls Finder to trash the files (effectively prompting for authentication). You can read more info of trash from hasseg.org/blog.